The fate of the public marinas in the City of Miami remains unclear as city officials debate the best practices that would bring in the most revenue to a city facing growing financial challenges. Beginning in 2018 and spilling over into this spring, commissioners are discussing the operations at city-owned and operated marinas, and those on city-owned land but managed by a private company. 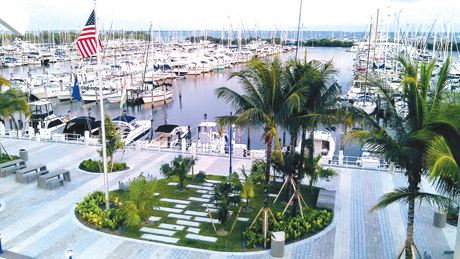 The venues operate differently and three of the marinas are run by the city itself: Dinner Key Marina, Marine Stadium Marina, a dry storage facility, and Miamarina at Bayside. For several months, commissioners have asked the city administration for information on the potential methods by which the city marinas could be operated and analysis of current operations. At the latest discussion, March 14, commissioners learned of a sizeable financial loss at the Marine Stadium Marina on Virginia Key. Daniel Rotenberg, director of the city’s Department of Real Estate and Asset Management, reported on losses at the dry dock facility, which are related to the city-owned site being used to stage the annual Miami International Boat Show. For several years the city has licensed use of the property and water surrounding idled Marine Stadium for the boat show. Mr. Rotenberg said some dry stacks were removed from the Marine Stadium Marina due to the boat show and were never replaced. He said that equates to a loss of about $240,000 in revenue a year. In addition, the city has lost $150,000 in concessions given during the boat show, he told commissioners. Commissioner Joe Carollo said he thinks the financial hit has been even more substantial and repeated his desire to see the marine facility operated or managed privately. “That’s still not what I’m seeing… We need to put real management there,” said Mr. Carollo, who again stated his belief that many city properties are not bringing in the amount of revenue they should. Commissioners Manolo Reyes, Keon Hardemon and Wifredo “Willy” Gort have expressed agreement on that point. Mr. Rotenberg voiced specific agreement regarding the Marine Stadium Marina facility being run differently. “There are issues over there that need addressing. I’d like to get it privatized,” he said. According to the city’s website, Marine Stadium Marina was one of South Florida’s largest full-service dry storage marinas. Before dry storage racks were removed, according to the website, the facility was capable of storing 300 vessels with a length to 45 feet and gross vessel weight to 18,000 pounds, and the operation brought in an average of $1 million a year to the city. “We lost 35 to 40 stacks,” Mr. Rotenberg said of those removed and never replaced. Mr. Reyes then mentioned the state of damages at the city-owned and operated Dinner Key Marina, hugging City Hall on the Coconut Grove waterfront. “All of these slips are not being repaired, while we wait for FEMA [Federal Emergency Management Agency], and we are losing a lot of money,” Mr. Reyes said. City staff members said they are no longer simply waiting for the FEMA reimbursements and have officially launched a request for proposals process to get the needed repairs to Dinner Key Marina. “I don’t understand,” said Mr. Carollo, who said the private company that operates a marina at the nearby Monty’s site has been able to rebuild docks damaged in the same storm: Hurricane Irma in September 2017. Mr. Carollo agreed the city is losing money by not repairing Dinner Key Marina, and he asked why. “The main reason is that our process of procurement is cumbersome,” Mr. Rotenberg said, and there are countless “hoops” to jump through to gain the FEMA money. Mr. Carollo asked how much the city expects to get from FEMA for the storm. A staffer said approximately $7.5 million. Staff also reported that about $3 million in business interruption insurance the city has is being contested. Commissioners complained of the passage of more than a year and four months since the hurricane with the marina far from being repaired. “We are losing money. We need to fix the docks and charge FEMA,” stressed Mr. Reyes. In the meantime, Rickenbacker Marina on Virginia Key continues to operate under private management on city-owned property. The fate of that marina is in limbo and is tied to the operations at nearby Marine Stadium Marina. A request for proposals in 2017 had a new process determining Virginia Key LLC as the top ranked proposer, for lease and development of the city-owned waterfront property for marinas/restaurant/ship’s store uses. The request includes Rickenbacker Marina and Marine Stadium Marina. Controversy continued to follow the marina matter as the second-place bidder – the current operator of Rickenbacker Marina – filed a bid protest. Under the new process, the case was heard by a special master who backed up the selection of Virginia Key LLC. The second-ranked proposer then went to court, where the matter has lingered for more than a year.